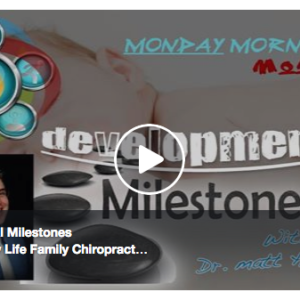 Developmental Milestones & The Chiropractic Approach. In today’s video, Dr. Matt is going to cover why kids today are Out of Balance and the 3 major stressors your kiddos face every day that delays age-specific developmental milestones. Physical stress, chemical stress, and emotional stress. Topic includes how Chiropractic care can help support the central nervous system by improving joint range of motion and neurological integrity with developmental milestones, minor illness, recurring colds, flu’s, allergies, behavior issues, agitation, oversensitive to environmental noises, eczema, pale skin, discoloration under the eyes, bloated tummy, constipation, hyperactivity, defiant or angry behavior, consistent low mood or lack of enthusiasm for life, hard time sleeping, fatigue upon waking in the morning, general sluggishness, out of balance, lack of coordination, poor posture and neuromotor development. Natural pregnancy is covered and the importance of breastfeeding. Most importantly, if you already are getting your kiddos checked Chiropracticly, Dr. Matt is going to show you some easy strategy you can do at home, from the kitchen to the gym, to school, to bedtime. By the end of this video, you will have the tools you need to better organize your household and create healthy, strong and smart kiddos worthy of academic honors, healthy bodies and positive emotional intelligence!..